Why was Daniel in the lion’s den? Who put Shadrach in the fiery furnace? What was the handwriting on the wall? Read on for answers to these burning questions. "Daniel in the Lions' Den" is almost as famous as "Noah's Ark." Children know that the LORD protected Daniel from the hungry lions, who in the paintings always look very well-fed and placid in any case. Children also know that the LORD protected Shadrach, Meshach, & Abednego in the fiery furnace. These are both important things to know, but as a grown-up, aren't you just a wee bit curious about what they were doing there? What had they done? Who put them in the lions' den and the furnace? What happened after they got out? What the heck does "MENE, MENE, TEKEL, UPHARSIN" mean? You mean all three of these stories are related?? In order to understand these stories, we are going to have to do some background reading, so hang in there today and tomorrow, and later this week we will read "Shadrach, Meshach, & Abednego," "Writing on the Wall," and "Daniel in the Lion’s Den." So here's the situation. The Kingdom of Judah had gone so far into apostasy and decadence that God decided to punish his people to see if they couldn't get their heads straight. Jerusalem was besieged by the armies of Babylon, and after three years of war and famine, the city fell. Essentially the entire remaining population – a fraction of what it had been – was taken away into what is called the Exile or the Babylonian Captivity, to be slaves. Four nobly born teenagers named Daniel, Hananiah, Mishael, and Azariah were among the exiles, and they were selected to serve in the palace of King Nebuchadnezzar. Apparently they had not been apostate and decadent before the Captivity, however, because even now they did not want to defile themselves by eating the unclean (i.e., non-kosher) food of the Babylonians. Palm reading, fortune telling, and horoscopes are all based on the principle that everybody is pretty much the same. For example, Dear Reader, here is a reading that I have prepared especially for you: Sometimes you have thoughts that you don't want to share with anyone. You have some regretful memories from your childhood. There's something you want to do, but somehow the time has never seemed right. Am I right, or am I right? Of course I'm right, because those three statements are true about everyone over the age of two. But if I put on a turban and gazed deeply into your eyes, you would think I was pretty smart. King Nebuchadnezzar had apparently dealt with fortune tellers and their ilk before, and he had caught on to this fundamental truth. So when he started having bad dreams, he said that before he would listen to anybody's interpretation, he wanted them to tell him his dream. That way he would know whether they were smart or just smart-alecks. No one could do that, all the fortune tellers got kind of huffy about it, and the King decided to execute the lot of them. Daniel and his friends were also slated for the hangman, but when Daniel heard the problem, he immediately knew the solution: prayer to the living God. He successfully told the King the dream and the interpretation, both of which God had revealed to him. Naturally the King was impressed, and Daniel and his friends were raised to positions of considerable power and prestige within the Babylonian empire. This is the first of four great signs that God gave to Nebuchadnezzar. Oh-KAY. Finally we are getting to the fiery furnace, although come to think of it, getting to the fiery furnace is not something we should be looking forward to. Anyway, you remember that Shadrach, Meshach, and Abednego were the Babylonian names of three Jewish youths, Hananiah, Mishael, and Azariah, who were enslaved as part of the Exile. And you remember from yesterday that they did pretty well for themselves, and the King appointed them to positions of prestige and power in his court. This made some other people at the court jealous. When the King set up a giant golden image and passed a law that everyone had to worship it, the enemies of Shadrach, Meshach, and Abednego saw their chance to get even. You need to understand that once a law was passed, it could not be repealed. Period. You might think that people would consider the consequences more carefully of any law they passed under those circumstances, but you would be wrong. Shadrach, Meshach, and Abednego refused to bow down to the image, and their enemies took great delight in reporting them to the King. He ordered them again to worship the image, on pain of death. Note what they said: “Our God can save us, but even if he doesn't, we will not bow down to any other god.” That's faithfulness! So now you know why they were in the furnace in the first place. Then comes the children's story: God saved them. The King was so impressed that he passed a second law, saying that no one could speak out against God, and he promoted Shadrach, Meshach, and Abednego. This is the second great sign that God did in Nebuchadnezzar's court. I can't help but think that God was trying to convert Nebuchadnezzar by showing him all these signs of power. Unfortunately Nebuchadnezzar didn't get it. For an explantion of the Random Walk, see the introduction. In this passage from Daniel, there’s a hand writing on the wall. That hand didn’t make it into the illustration, but I like the artist’s portrayal of the human hands. The king is wringing his hands in anxiety. The queen is clinging to her husband. Daniel, in contrast, has good strong hands, and he’s using them to point to God’s message. I also really like the way the artist has portrayed the relationship between the king and Daniel. The king and queen seem to be in awe of this foreign prophet who is able to interpret the message. This is a pretty good trick, because the artist apparently didn’t consult a Hebrew scholar – some of the characters on the wall look vaguely foreign, but the writing is gibberish. Or maybe the artist intended that no one in his audience would be able to read it, so that it would be gibberish to us, just as it was for the king and court in Babylon. Introduction to the Random Walk. Next Step. Image from the Binns family Bible, now in the private collection of Regina L. Hunter. Can you read the handwriting on the wall? We all know that this English idiom means "figure out what's going to happen from observation of hints and clues," and after last Saturday's supplement, we aren't at all surprised to learn that it came into English directly from the Bible. In particular, it comes from today's Bible story. King Nebuchadnezzar was succeeded by his grandson, King Belshazzar. Belshazzar gave a giant feast (while Darius the Persian was besieging the city), and during the feast he used the gold and silver bowls that Nebuchadnezzar had looted from the Temple before razing Jerusalem. Okay, that's bad. But then Belshazzar and all his guests began to praise the gods of gold and silver, which is a lot worse. It appears to me that this is what got Belshazzar into such serious trouble. Because God is merciful and slow to anger, He tends to cut pagans who have never heard of Him a lot of slack in their ordinary lives. But to take vessels from the Holy Temple in Jerusalem, use them at a drinking party, and then praise some other god for them is to despise God and attribute to other gods the works of God. Then comes the children's story: the hand appeared and wrote on the wall, and Daniel interpreted it. Belshazzar's language was somewhat related to Hebrew (think English and German), but it was written in cuneiform. Daniel, of course, spoke and read Hebrew, so he had no trouble reading what was written on the wall in Hebrew. Scholars naturally are not 100% agreed about what the words MENE, TEKEL, and PARSIN mean, because as you remember, they might mean different things depending on what vowels are put in. However, there is a big school of thought that they should have the vowels that make them into the ordinary Hebrew words meaning "numbered," "to weigh," and a play on "divided" and "Persian." Since those are the meanings that Daniel ascribed to them when he was interpreting for God, I think we ought to go with them. Daniel first came to prominence in Babylon under King Nebuchadnezzar, and became even more important under King Belshazzar. After Darius the Persian conquered the Babylonians, Daniel's rank rose even higher. People and politics being what they are, other high-ranking officials wanted to get rid of Daniel and take his place. No fault could be found with his work, so they decided to come up with something else. Remember the law that no law could be repealed? Daniel's enemies, knowing that Daniel would never worship anyone but God, got King Darius to pass a law that no one could worship anyone but Darius for 30 days, and then immediately reported Daniel for breaking the law. 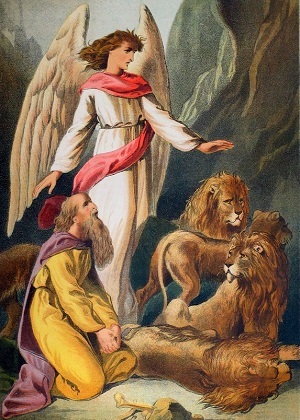 Then comes the children's story: Daniel was put into the lions' den, and God saved him by preventing the lions from killing him. King Darius was so relieved and happy that Daniel survived that he immediately ordered Daniel's enemies and their families to be put in with the lions, and they did not survive. Usually that part is omitted from the children's story. Darius also decreed that everyone in the kingdom should worship God, although apparently few or none converted to Judaism. Probably they just added God to their existing pantheon. The next king, Cyrus the Persian, allowed any Jew who wanted to go to return to Judah. The color illustrations are from the Binns family Bible, now in the private collection of Regina L. Hunter.